This one way connection scheme allows the customer to receive download data from the Turksat 2A satellite while sending request packets by conventional dial up modem phone line. This service requires a receive only satellite TV type dish with an LNB mounted in front, connected with one cable to a card plugged into your PC. Coverage includes Turkey, Georgia, Armenia, Azerbaijan, Turkmenistan, Uzbekistan, north west Iran, Cyprus, Israel, Palestine, Syria, Lebanon, and Iraq. Costs of one way satellite internet are lower than for two-way satellite internet. Please note I have no experience of this company or the new service described here. Previous details here which had a link to the wrong beam coverage and service have been replaced. 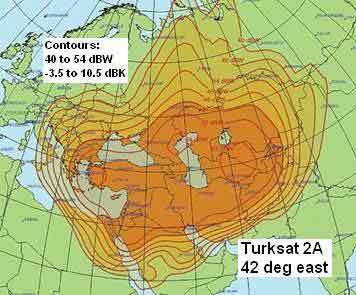 The satellite coverage map shows the download beam from the Turksat 2A satellite located at 42 deg east orbit longitude. The downlink power contours range from 54 dBW EIRP (the small circle around Uzbekistan) to 40 dBW on the outer contour shown in 2 dB steps. Each 2 dB step down requires a dish 1.25 times larger diameter.